One of the finest British war films ever made, Sink the Bismarck! tells the true story of one of World War II’s most notorious sea battles. In the Spring of 1941, Nazi Germany’s greatest battleship – the Bismarck, scourge of Atlantic shipping, is pinned down at her anchorage in Norway. Making a break for freedom and the safety of air cover from the Luftwaffe, the great ship is chased by the Royal Navy, led by the Admiralty’s Chief of Operations, Captain Jonathan Shepard (Kenneth More), and WRNS Second Officer Anne Davis (Dana Wynter). 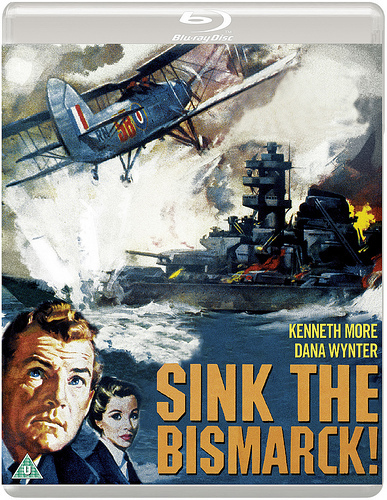 Directed by the late Lewis Gilbert (Alfie, The Spy Who Loved Me), Sink the Bismarck! received acclaim for its authenticity and nail-biting combat sequences. Eureka Classics is proud to present the film in its UK debut on Blu-ray.